I made it out to Berlin recently to visit friends. I thought that, without a doubt, I would walk away with some new wonderful currywurst addiction. Instead, I fell in love with Kartoffelsalat, or German potato salad, which I picked up as a side dish one damp and chilly afternoon at Curry 36, an apparently famous (according to my travel buddy and Lonely Planet) currywurst stand under a city rail overpass. (The currywurst was okay, too, but nothing in comparison.) After that, it seemed like Kartoffelsalat existed everywhere I went. There are a few different kinds, of course, Germany being a relatively large country and made up of various regions that like to claim cultural independence from each other (try referring to a Bavarian as German and you’ll see what I mean). 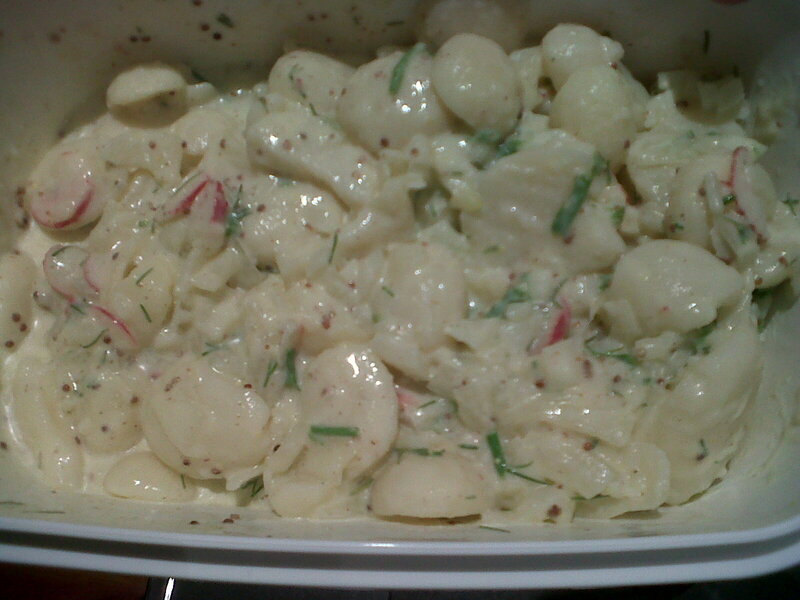 Anyways, this particular potato salad was served cold (or Kalter), as opposed to this type of hot German potato salad. This salad had a light but slightly creamy sauce to it, and my friends and I couldn’t figure out exactly how that was done. Yes, it could have been mayonnaise, and according to the internet it was mayonnaise. But it didn’t taste like mayonnaise. I looked high and low on the internet but I just couldn’t find exactly what I had fallen in love with. So I had to improvise. One friend had suggested perhaps sour cream–and that got me thinking. I took the basic recipe of peeled and cooked potatoes, marinated in onions and a little bit of the water they were boiled in, mixed with vinegar, mustard and seasoning. Having recently become ridiculously attached to creme fraiche (which is related to sour cream), I thought this would be the perfect addition to add the slightly sour, slightly tangy, creamy texture to the salad that I was looking for. It came out great!! I also added things not mentioned in the recipes I was looking at, but that had made such a big difference in Berlin: fine rings of radishes, and sometimes green onions and chives, depending on the place. So delicious! For the dill haters out there, just know that I usually don’t like dill either, but just a little bit of fresh chopped dillweed does add an almost summery quality to the salad. Preparation time: About 3 hours, including skinning and boiling the potatoes beforehand, and 2 hours of marinating. Okay, I cheated once again and used vacuum-sealed, pre-boiled, pre-skinned potatoes, although in this case I do think it would be better to use fresh potatoes because you want to save some of the water in which they’re boiled. Also, the potatoes in Berlin were a tiny bit firmer than the usual typical American potato salad, and the pre-boiled ones were too soft for my preference. Chop up the onion into thin strips, slice the potato into disks, mix these in a large bowl and pour a small amount (1/4 cup or less) of the water the potatoes were boiled in (if you have it) over the mixture. Cover and marinate at room temperature for 2 hours. After marinating, add vinegar and mustard. Supposedly the texture would be “creamy” as-is, according to every internet recipe I saw, but it was nothing like what I had in Berlin. So, I decided to add a few dollops of creme fraiche, which immediately thinned out upon contact with the water, mustard, and vinegar. That definitely did the trick! Nice and creamy potatoes, after much ado! Add in the dill, radishes, green onions, and chives. You’re ready to go! Enjoy!